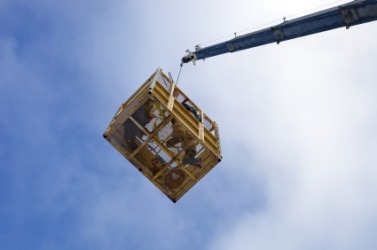 A crane is used to hoist a basket in the air. The definition of a hoist is something used for lifting heavy things. An example of hoist is a device used to help movers lift pianos. Hoist is defined as to raise or lift using a rope or a pulley. An example of hoist is to pull up a sail on a sailboat. "hoist." YourDictionary, n.d. Web. 21 April 2019. <https://www.yourdictionary.com/HOIST>. To raise or haul up, often with the help of a mechanical apparatus. See Synonyms at lift. To raise to one's mouth in order to drink: hoist a few beers. To become raised or lifted. An apparatus for lifting heavy or cumbersome objects. The act of hoisting; a lift. a. The height or vertical dimension of a flag or of any square sail other than a course. b. A group of flags raised together as a signal. To raise; to lift; to elevate; especially, to raise or lift to a desired elevation, by means of tackle or pulley, as a sail, a flag, a heavy package or weight. (historical) To lift someone up to be flogged. (intransitive) To be lifted up. (computing theory) To extract (code) from a loop construct as part of optimization. "Hoisted" is about fifteen times more common than "hoist" in US usage as past and past participle. A hoisting device, such as pulley or crane. Give me a hoist over that wall. The perpendicular height of a flag, as opposed to the fly, or horizontal length, when flying from a staff. The vertical edge of a flag which is next to the staff. The height of a fore-and-aft sail, next the mast or stay. Alteration of hoise, apparently based on the past tense and participle. Compare Danish hisse, German hissen, Italian issare (loaned from a Germanic source). They asked if he was injured and assured him they'd hoist him up to the road. But, on his return, he forgot to hoist the white sail, and his father, supposing that his son had lost his life, threw himself from a high rock on which he was keeping watch into the sea, which was afterwards called the Aegean. It is converted into steel by the EE, Hoist-track. Von Hoist, The Constitutional and Political History of the United States (Chicago, 1899). So is it possible " to have the enginer hoist with his own petar."